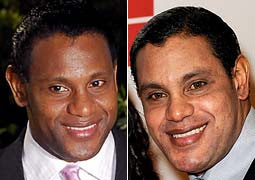 An Opinion On Sports: Sammy Sosa: Not Like That Mike..
Sammy Sosa: Not Like That Mike..
Hey Kellen: Can We Get Five "Moore"? How About a "Pike Six", Tony? Whatever Happened to the 'Double Bar' Face Mask? Matthew Stafford: Heart of A Lion! Les Miles: Why Is Your Nose Getting Longer? Well I'll Be "Vol Gone"
Notre Dame: Are You Crying? It's Veterans Day! Observe It! Elizabeth Lambert: " A Girl Gone Wild"
LaGarrette Blount: A Second Time Around..
Hines Ward: Dirty or Just Hard Nosed? Rodney Scott: An Ole Miss Hero!